See video of our first and second test drives in 2008, including some from on-board cameras. More videos, including some "behind-the-scenes" looks at the build, can be found on MIT TechTV. Thanks for the blog entries! Yes, ultracapacitors, vehicle-grade batteries, and large electric motors can be dangerous. Build at your own risk! Summer 2010: After taking a year off to build a 2WD electric kick scooter, we're back at work on the go-kart. We've joined the 21st century and changed to lithium-ion batteries, which net a weight savings of over 100lbs. We also added a custom-built differential to the rear axle to help with tight turns. The custom controller is much more sophisticated as well, with new driving modes that mimics a continuously variable transmission using the SepEx motor, as well as better fault detection. 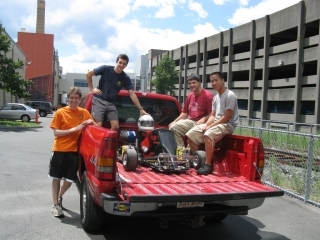 The ad-hoc team known as the Edgerton Center Summer Engineering Workshop has built three electric vehicles to date, including a DIY self-balancing scooter (2007), the Cap Kart (2008 and 2010) and a 2WD electric kick scooter (2009). The team comprises high school and college students, many from FIRST robotics teams, with a shared interest in "things you can ride." Projects and teams like this are made possible by generous support from sponsors interested in furthering engineering education. If you or your company is interested in getting involved, please contact us. 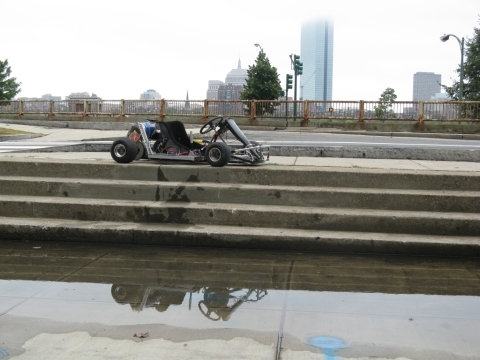 The Cap Kart is first and foremost a battery electric vehicle - all of its intial energy stored in its battery pack. (Thus, it uses no fuel and has zero emissions.) However, the kart gets its name from the 110F/16V ultracapacitor module used as a power buffer. The capacitor can only store about 1/400th as much energy as the battery pack, but this amount is comparable to the kinetic energy of the kart. Thus, the capacitor can be used to recapture energy during braking and later supply a boost during acceleration. 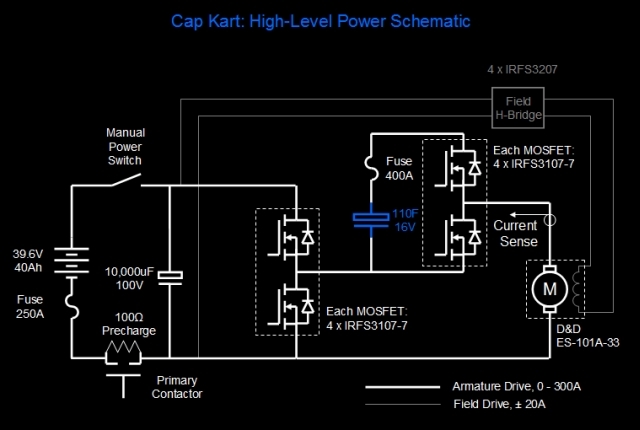 To do this, the Cap Kart uses a simple and unique series circuit that combines the battery and capacitor. For more information, check out the presentation we gave at the EVER '09 conference in Monaco. 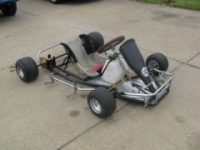 The more obsessive members of the team insisted on a racing chassis on which to build our electric kart, so we acquired a used Haase racing kart, minus the engine. It was perfect for the job: wide enough to fit the batteries, low enough to stay stable, strong enough to take the extra weight, and efficient enough to utilize the power. We were initially surprised to find that capacitors this size are already commercially available. Maxwell Technologies is one of a handful of manufacturers of ultracapacitor modules designed specifically for automotive use. Our 110F/16V module stores about 14kJ when fully charged. While this is not much more than a AA battery, it's the equivalent in potential energy of the go-kart starting at the top of a 20-foot hill, and can be released in seconds. In 2010, we upgraded the kart to lithium-ion batteries, which saved over 100lbs compared to the original lead-acid batteries. 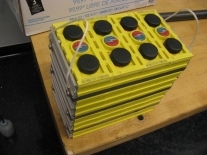 The new batteries are Thundersky 40Ah cells, 12 in series for 39.6V. The total pack weighs just 42lbs, costs less than $600, and can source about 8kW peak, 4kW continuous. 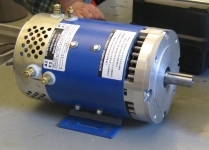 The motor we chose is a SepEx DC motor from D&D Motor Systems. It has no magnets; instead, field coils are energized to create the magnetic field. Unlike a permanent magnet motor, the strength of the magnetic field (and thus the torque curve) can be varied. Our controller has two modes: one that simulates a manual transmission by varying the field in steps and one that simulates a CVT by using continuous field weakening. No commercial motor controller fit our needs perfectly, so we built our own 300A-peak MOSFET-based controller with components cheap enough to be considered consumable (and many MOSFETs have been consumed). The circuit configuration is a simple half-bridge - reversing is handled by the field. The MOSFETs have varied from 8xIRFB3207 to 1xVMM1500-0075, based on what we have handy. The software for the kart is implemented on two Texas Instruments microcontrollers. One handles driver inputs, the other handles motor control. They communicate wirelessly and send telemetry to a laptop for real-time display and logging. 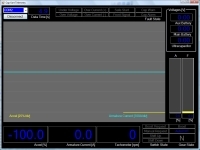 In 2010, we updated the software and data logger to perform more fault monitoring and advanced motor control. In 2010, we also added a custom-built rear differential to improve handling (also just a badass MechE project). The design is based on the spur gear differential used in LOLriokart. It has the advantage of being relatively easy to build from scratch with minimal tooling - highly tolerant of axial misalignment. 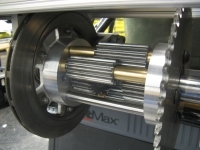 The differential case carries both the drive sprocket and the brake disk. This is the power converter implemented on the Cap Kart. It combines batteries and an ultracapacitor module in a simple series configuration, as opposed to placing them in parallel. The first set of MOSFETs is used for high-power DC-DC conversion, which is controlled to set the current through the motor. A second set reconfigures the circuit for boosting and regenerative braking with the ultracapacitor. When the ultracapacitor is added in series with the output, the power sourced or sunk by the batteries is decreased automatically by the primary converter. More information is available in the technical documentation and our EVER '09 presentation. EVER '09 Presentation - Our presentation at the EVER '09 conference gives a good overview of the project and the series ultracpacitor configuration. Simple Modular Half Bridge Rev.1 - This is an updated version of our motor controller documentation. It describes a simple design for a modular half-bridge that can be used for high-current DC motor control. You probably only want to attempt to build this or something like it if you are genuinely interested in power electronics design not afraid to blow up a few MOSFETs along the way. For most EV needs, there are reasonably-priced off-the-shelf controllers such as the Alltrax line. This is raw data from our test drives and flywheel testing. The format is a comma-delimited text file with two header rows: The first header row specifies the date and start time, the second has the column headings. Raw data from our first test-drive (5 runs). No ultracapacitor data. Raw data from our second test-drive (5 runs). Includes two-speed and capacitor boost data, but no regen. Raw data from the flywheel testing. 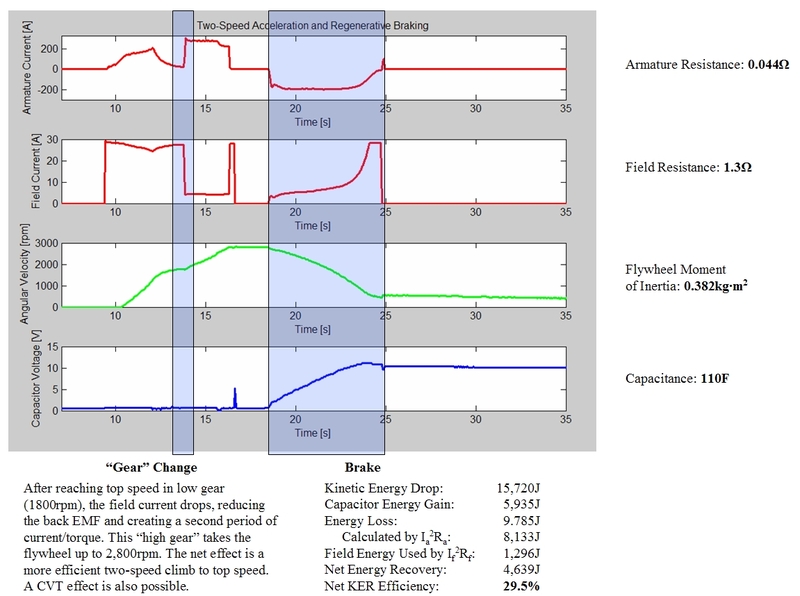 Raw data from the second set of flywheel tests, with improved regenerative braking. This data has been processed and in most cases visualized. Each set highlights particular vehicle functions or other interesting test events. 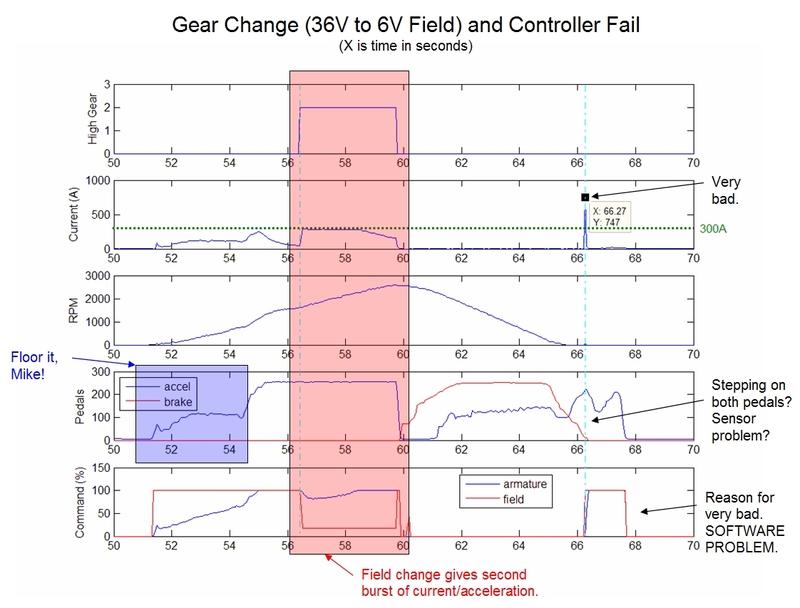 Data highlight showing two-speed field-weaking mode and a MOSFET failure. Data highlight showing the first test-drive of ultracapacitor boost. 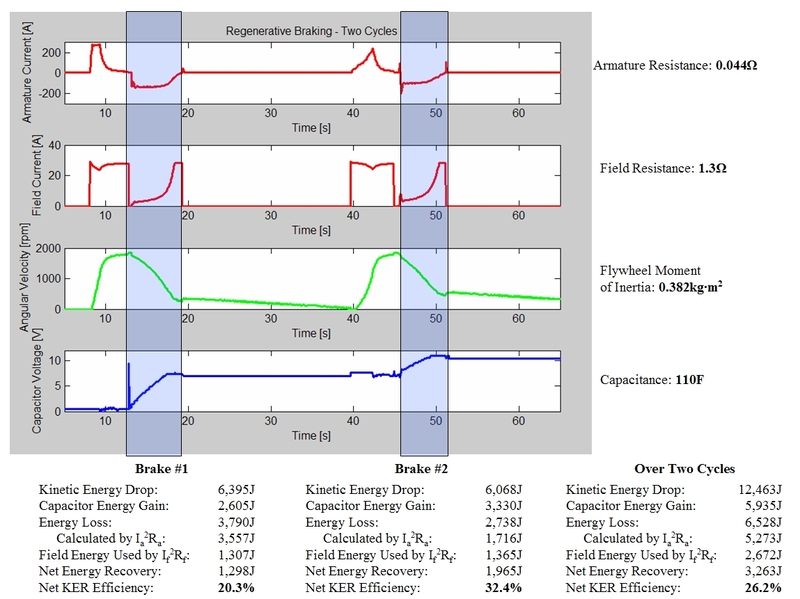 Data highlight showing capacitor regenerative braking over two cycles (flywheel). 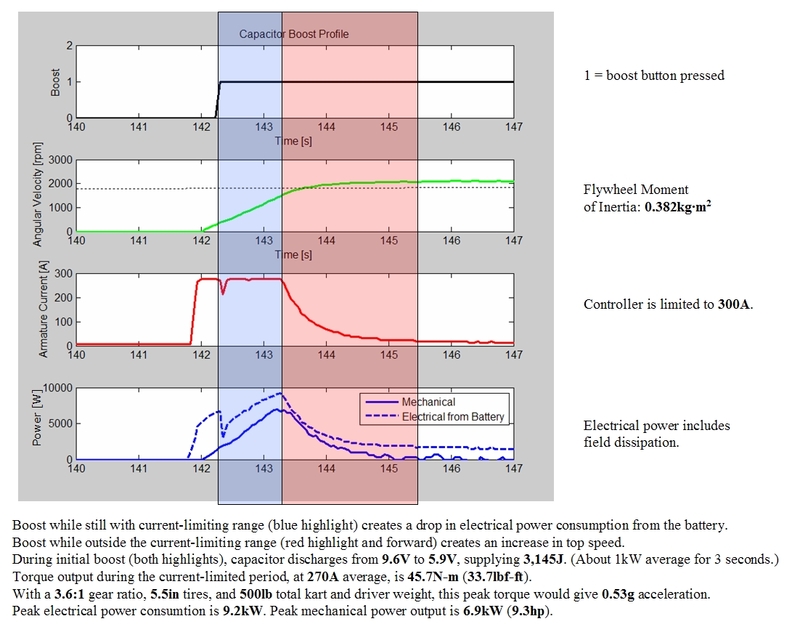 Data highlight showing capacitor regenerative braking from high speed (flywheel). 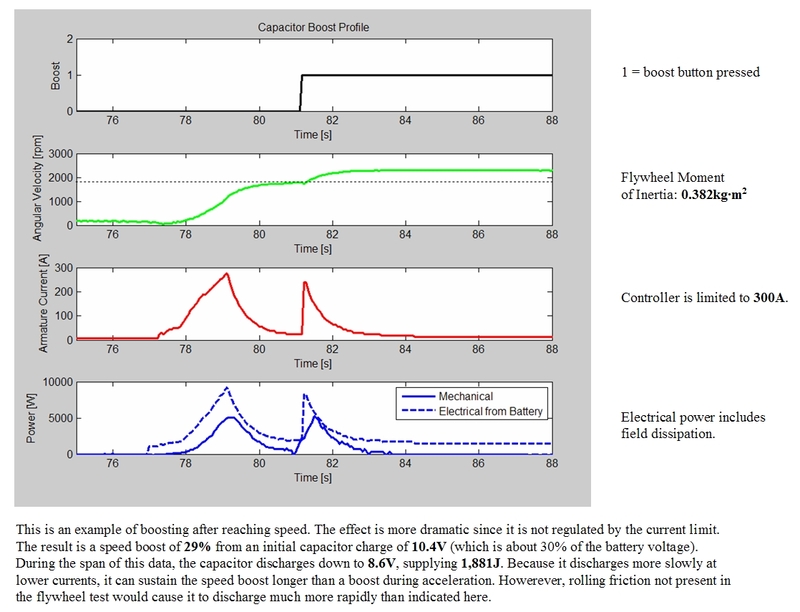 Data highlight showing capacitor boost to reduce battery current (flywheel). 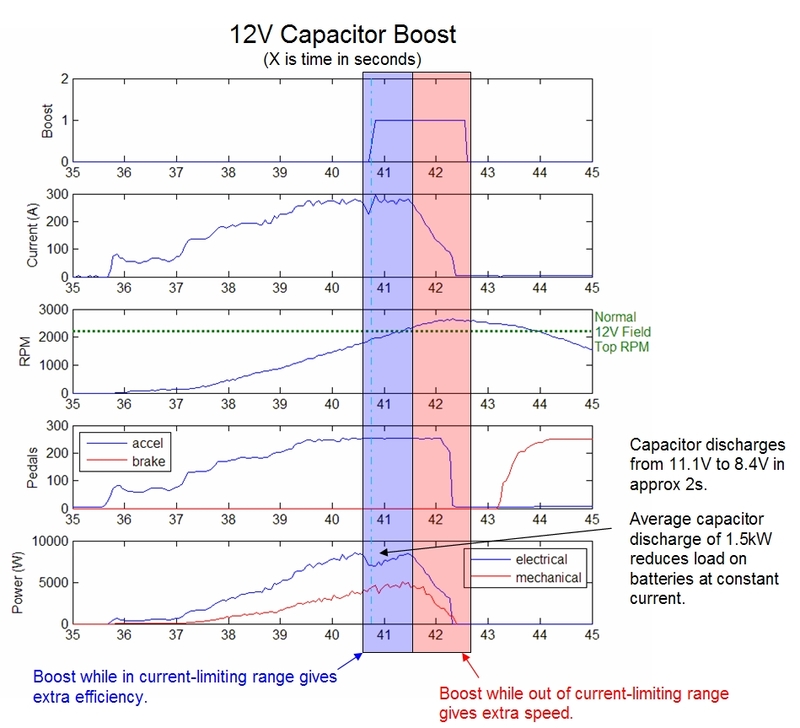 Data highlight showing capacitor boost to increase top speed (flywheel). D&D Motor Systems, Inc. - Motor source. Maxwell Technologies via Tecate Group - Ultracapacitor source. The Robot Marketplace - Misc. parts source. EVParts - More great electric vehicle components. West Marine - Battery source. International Rectifier - Source of power MOSFETs for motor control. 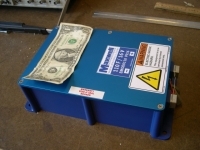 Big Blue Saw - Custom-cut metal for mounting hardware, flywheel steel. SolidWorks - Our favorite CAD software. 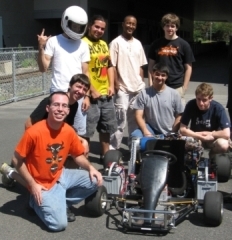 Un support p�dagogique pluritechnologique: le kart �lectrique - A paper (in French) outlining the design of an electric go-kart as an educational project. 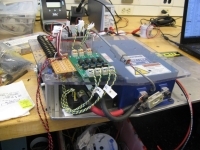 4QD-TEC - One of the only sites on the internet that simply (and correctly) explains DC motor control and regenerative braking. MIT Electric Vehicle Team - With a stylin' electric Porsche. Solar Electric Vehicle Team - "Tesseract" and "Eleanor"
Media Lab Smart Cities Group - Check out the City Car and Roboscooter in the Mobility division. LEES Ultracapacitor - Approaching the energy density of batteries. Go Green Go-Kart Competition - Winston-Salem/Forsyth County Schools are hosting an alternative fuel go-kart competition for high school teams on May 20, 2009. E-Kart - A program and competition in France that promotes electric karts as an educational tool for universities. 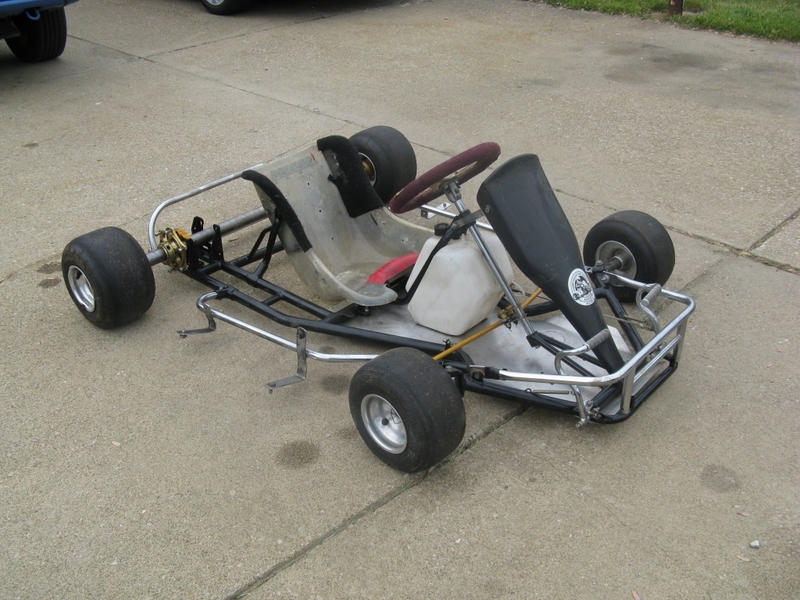 Cranfield University Electric Go-Kart - A dual energy source kart that precedes ours. Cranfield IEEE paper. - Technical description of the above. Electric Green Racing - Awesome video from a dual energy source electric kart team from the University of Manchester. Mythbusters Electric Go-Kart - Featured in Popular Mechanics.